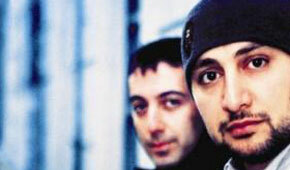 Deep Dish are the duo of Dubfire and Sharam. Originally from Iran, they took root in the Washington, DC area in the early 90's and established themselves as top-flight producers and DJ's, releasing several mix-cds (most notably "Penetrate Deeper") and building production credits on Tribal Records and their own Deep Dish Records. They had successful collaborations with BT and Carl Crain, and several of their remixes were instant classics, including their remixes of Sandy B's "Make The World Go 'Round". Their "Yoshieqsue" and "Global Underground: Moscow" mix-cds brought them massive acclaim around the turn of the century, and they now rank among the most popular DJ's in the world, while continuing to chalk up remixes for the likes of Madonna, DJ Rap, Delerium, and Justin Timberlake. They run the popular house labelYoshitoshi, as well as its sister labelsShinichi and Yo!.